Following models can be upgrade to add HDR function. Perform steps 1 through 4 listed below. Step 1: Check the current version of firmware used by your TV. Step 2: Download an updated version of the firmware and double click the downloaded file to decompress it. Step 3: Copy the firmware file onto a USB flash memory. Step 4: Install the firmware update. Step 1. 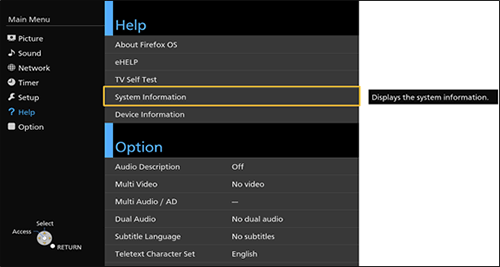 Check the current version of firmware used by your TV. Please check the current version of firmware. 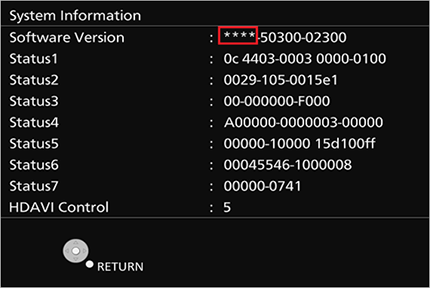 It will only be necessary to update the firmware if the version that you have in your TV is earlier than 3.228. Press [Menu] button to display Main Menu. 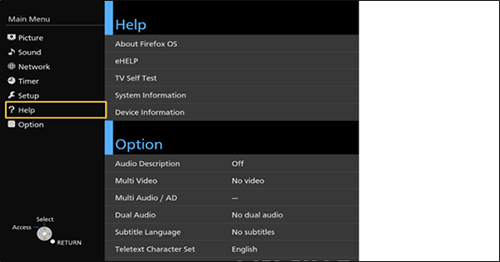 Select "Help" in Main menu. Select "System information" in "Help Menu"
If the firmware version indicated is earlier than 3228, then please upgrade the firmware. If the firmware version indicated is later or equal 3228, there is no need to upgrade the firmware. Please go to "Ⅱ. Upgrade Video/Imaging firmware". Use of software downloaded from this site requires agreement with the License Agreement. Please review the contents of the License Agreement beforehand. Please go to Step2 when agreeing to the agreement. General Public License from the following button. Step 2. Download an updated version of the firmware and double click the downloaded file to decompress it. .Make a temporary folder on your PC for downloading the file,e.g. C:\Temp. Click the button to download and save the firmware in the folder you created in the above step. The file SDDL.SEC will appear. Depending on your browser settings the file may be downloaded automatically into your "DOWNLOAD" folder. If it's not automatically decompressed please use an archiver software to do that.